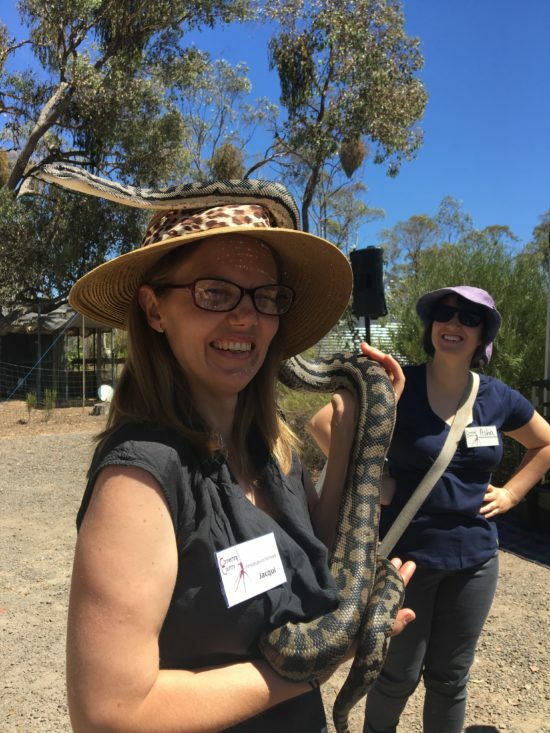 The weather was kind to us at our snake workshop on Saturday 19 January 2019 – sunny but not too hot. 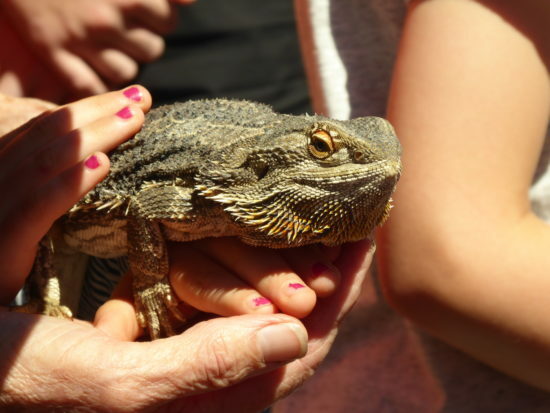 Over fifty participants were able to give the presenter and his reptiles their full attention. 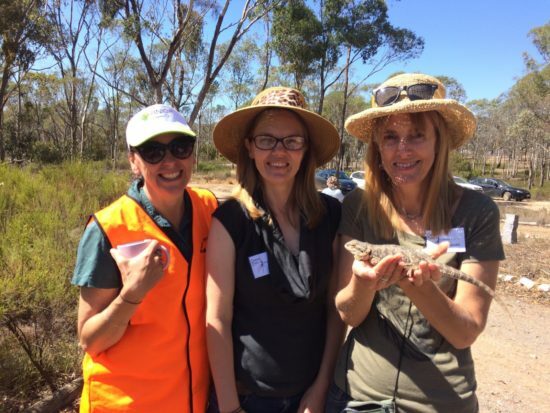 The event was run by Connecting Country in partnership with Muckleford Catchment Landcare, and supported by funding from North Central Catchment Management Authority. Stu from Snakehandler gave us a fascinating full hour presentation, including plenty of myth busting, introduction to different snake species and their ecology, and hints on snake safety and snake bite first aid. We all learned so much from Stu! 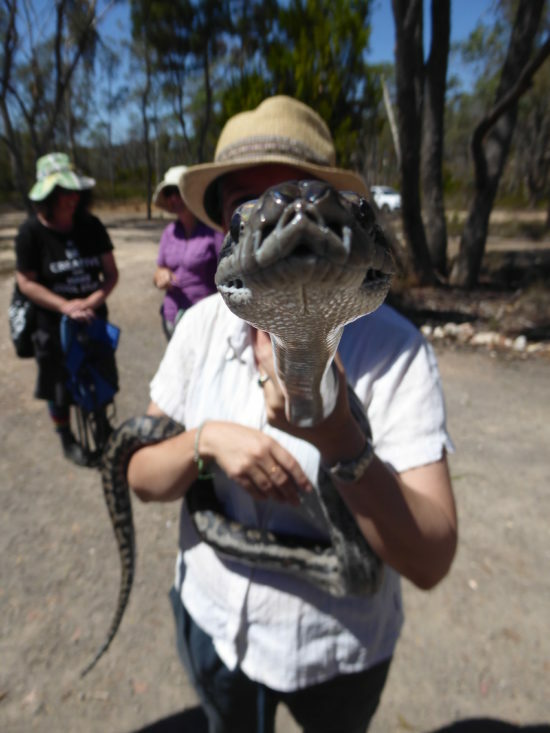 Stu has many years of experience and a great love for snakes and other reptiles. 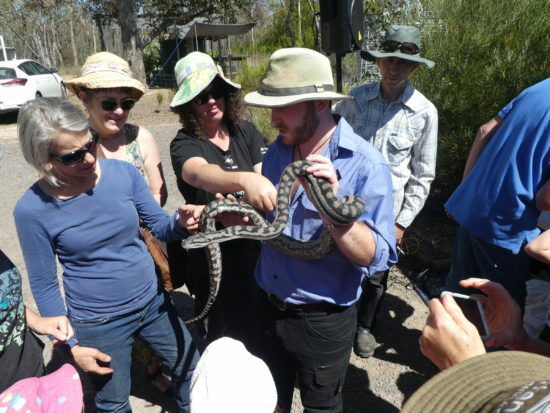 He helped us understand the importance of snakes to our local ecosystems, why snakes behave the way they do, and how we can all live safely with snakes. Frances took notes during Stu’s talk, which are well worth a read here. After the presentation, Stu introduced us to some real live reptiles! 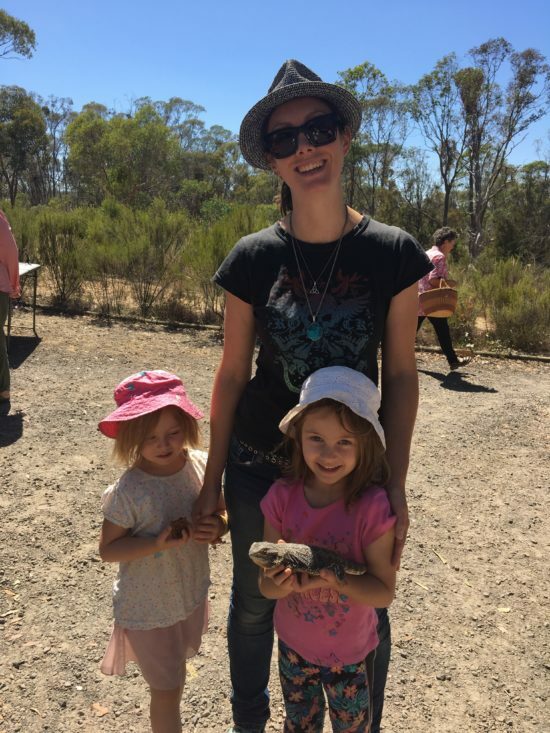 Those who wished were able to hold a very sweet Eastern Bearded Dragon, a Common Blue-tongue Lizard and a large Murray Darling Carpet Python, and also see some local venomous snakes housed in special terrariums. 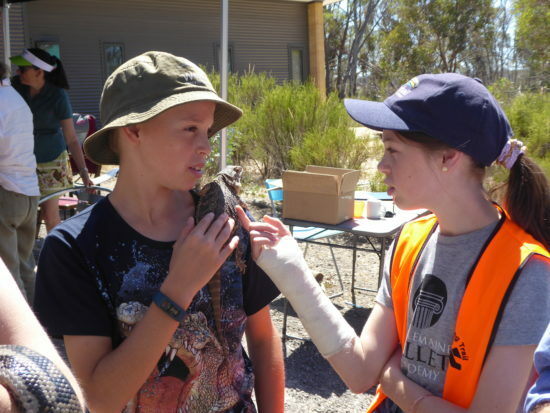 All species were native to central or northern Victoria. 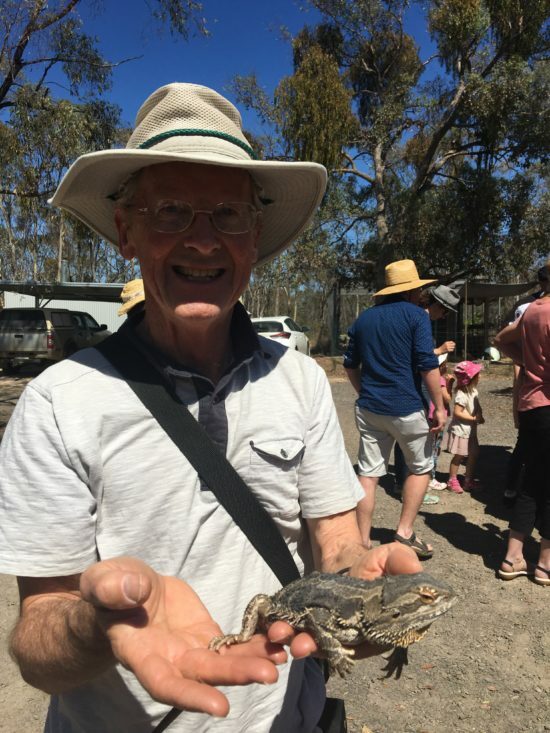 All the animals used for the presentations are selected for their temperament and ability to handle stress, and will be rested for weeks before being used again, as Stu and his team have plenty of reptiles. Many thanks to Stu from Snakehandler, Jacqui for organising this wonderful event, and to all those that assisted with set-up and pack-up. 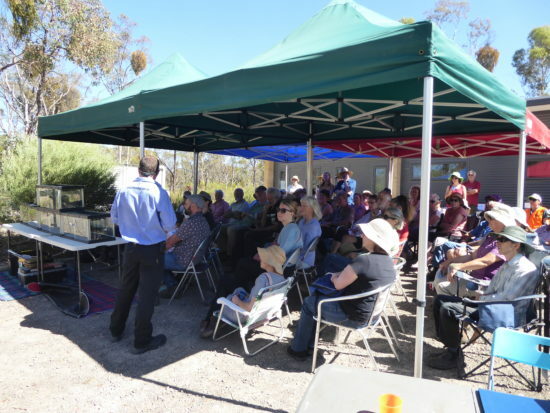 Special thanks to the Mellick-Cooper family who hosted the event on their beautiful property, and to Muckleford Catchment Landcare for the delicious morning tea. We hope all participants enjoyed the workshop as much as we did! Please enjoy this gallery of photos from the day – scroll through by hovering your mouse on the right of the picture.